Stephen Sondheim is perhaps the most revered and worshipped composer-lyricist in the American Musical Theatre, and though he has earned that status with an extraordinary canon of work, certain musicals he has written are obviously better than others. Opinion and personal preferences, of course, play into one’s feelings about his shows. As an experiment to sort out my enthusiasm and criticism of his work, I have ranked Sondheim’s musicals from his worst to his best. This musical went through several titles throughout its development: Gold, Bounce, and eventually Road Show. Hot Mess would have been a better choice as this musical has proven, time and again, with every inception. Road Show told the story of the Mizner brothers, two siblings who are challenged by their father (on his deathbed) to use their talents to help shape what America will become in the 20th Century. A misfire of epic proportions (at least for a Sondheim musical), the score is hardly memorable and the musical never really caught on with audiences. Nathan Lane and the ensemble of The Frogs. The idea for The Frogs, taking a popular Greek play by Aristophanes and turning it into a musical to be staged in the Yale swimming pool, was more an interesting idea of event theatre than an actual musical of superb content. The opening number “Invocation and Instructions to the Audience”, a tongue-in-cheek patter song about how theatregoers should behave, is the best number in the show. The problem with the show is that Sondheim doesn’t get deep inside his characters the way that he usually does. There is a detachment in The Frogs that makes it feel more like an essay on Greek Theatre than an engaging musical. Many people are diehard fans of Passion, but for me, I have always been left cold by its unpleasant characters, it’s dreary setting, and the fact that the title is misleading. This is not really a musical about passion, it is, however, a study in obsession. It’s Beauty and the Beast, but no one is particularly likeable and their actions are hardly redeeming. There are some powerful moments here and there, but the score is as gloomy as everything else. I kept hoping to find moments of warmth or reasons to root for these people. Their story ends badly, and they deserve what they get. Not many people are familiar with this Sondheim musical. It was originally scheduled to open on Broadway in 1955, but when the lead producer suddenly died, the money wasn’t there to keep the production moving forward. Down the road, many people wanted to produce it, but Sondheim was reticent to grant permission. Finally, the musical began to get productions, including a well-received Off-Broadway production in 2000. The story about how bachelors spend their Saturday nights and how one particular fellow gets himself in trouble, is not the deepest material for musicalization. Nevertheless, Sondheim provides an affable, if, at times, overly eager score that could stand some subtlety to provide it nuance. Farce in musical theatre is far and between, probably because farce relies on momentum in order for it to work. For the energy to build and the tension to heighten, you cannot be stopping to sing a song every five-minutes. A Funny Thing Happened on the Way to the Forum is the one exception where farce works in the musical form, and this is thanks predominantly to Sondheim’s lively score. “Comedy Tonight”, “Everybody Ought to Have Maid” and “I’m Calm” are great examples of how the composer-lyricist keeps the momentum farcical. This is especially apparent in Act One. The second half of the show is musically inferior the first, when the book has to take over and keep the hijinks propelling forward at maximum velocity. One of Sondheim’s early musicals for which he wrote both music and lyrics, Anyone Can Whistle has so many moments of sheer brilliance, but also so many moments that make one say “What the heck just happened?” Many considered the musical ahead of it’s time, a satire about political corruption in a small town and our societal willingness to follow charlatans who make big promises. Mental health and zealotry are questioned and mocked. 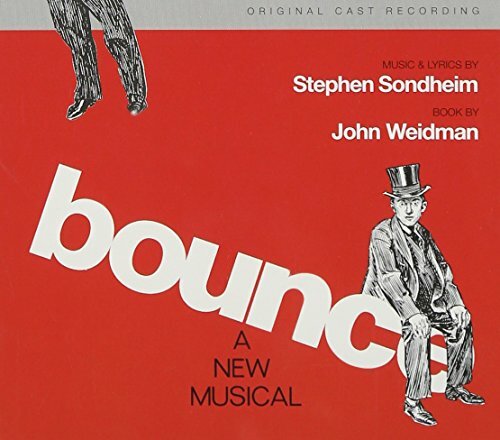 The score features some great Sondheim songs including the title song, the cut “There Won’t Be Trumpets” and “Everybody Says Don’t”. It’s a musical that is ripe for revisiting, especially since it remains topical in so many ways. I suspect that many of you are wondering why Follies isn’t ranked higher on my list, but I have always found that this musical works better in pieces than it does as a whole. First, there are too many characters to ever feel like you are emotionally invested in any of them. The two central couples are not happy people, their love having deteriorated over time. It’s all very fragmented, which a great director can help overcome with a brilliant concept and staging (something that most certainly happened with Harold Prince at the helm). Still, many of the songs are little affecting plays unto themselves: “The Road You Didn’t Take”, “Losing My Mind” and “Could I Leave You?” are all compellingly insightful into how these once-happy Follies performers became bitter and beaten. Perhaps the most historically important musical on this list, Company paved the way for musicals to explore a theme instead of following a linear plot. This was a key game-changer that reshaped how musical storytelling could unfold. The story follows the terminal bachelor Bobby as he wends his way through marriages of his friends, trying to determine his ability and willingness to connect. The score is one of Sondheim’s most-dated, much of it feeling as if it a product of its day (the early 1970s). Still, there is much to be admired, and many of the songs have become classics of the musical stage including the frantic “Another Hundred People”, the gut-wrenching “Being Alive”, and the visceral “The Ladies Who Lunch”. Sondheim has never shied away from exploring dark material, and Assassins may be one of the best darkly comic musicals to ever play Broadway. The musical follows men and women who tried (some succeeding) to kill the President of United States. Using traditionally American musical styles such as folk, barbershop quartet, ballads, and Sousa-inspired marches, Sondheim crafted music to convey the inner machinations of the minds of some of America’s most notorious criminals. The episodic, non-linear plot of the show allows Sondheim to explore, musically, a variety of time periods. Songs such as “The Ballad of Booth”, “Unworthy of Your Love” and “Everybody’s Got the Right” are standouts in a score that is always intriguing and just a tad too on the nose with its understanding of the failed American Dream. For me, there are moments of sheer perfection in Pacific Overtures that outshine almost everything else that Sondheim has written. This unique perspective of Japan's isolationism yielding to Western culture and capitalism, told with conventions of Japanese theatre, is a highly intricate and cerebral musical. "Someone in a Tree" is a thoughtful essay on how history is perceived, documented, and remembered, and "Chrysanthemum Tea" is a patient, building song about political intrigue and the necessity of taking down ineffective leaders. The only thing that keeps this entry from being higher on the list is how limited its appeal is to audiences. It's probably Sondheim's least-accessible piece to the average theatergoer. Probably Sondheim's most deeply personal musical (The song "Finishing the Hat" is a glimpse inside the brain of a committed artist), Sunday in the Park with George is an exploration of the artistic process and trade-offs one has to make to create, putting their art first. The musical tells the story of the creation of artist Georges Seurat's A Sunday Afternoon on the Island of La Grande Jatte and then jumps ahead 100 years and follows Seurat's great grandson, a struggling artist in his own right. The musical won the Pulitzer Prize for Drama, but can also feel cerebral and detached to many. Still, it boasts Sondheim's finest Act One finale "Sunday" and songs, such as "Move On" and "Beautiful" that shimmer with an electricity of quiet reflection. Though the book is plagued with problems and inconsistencies, Into the Woods has become one of Sondheim’s most popularly-produced titles. This musical, that takes famous fairy tales past their usual conclusions of “Happy Ever After” and into the realm of stark, brutal reality, has become a crowd pleaser, as well as a hit movie. The characters are broadly drawn, much like the archetypes they represent. It’s the score that is most effective, using the idea of taking responsibility for one’s actions as a recurring theme in numbers such as “No One Is Alone”, “No More”, and “Children Will Listen”. Though it is not the perfect musical by any stretch, it ranks high on this list for its accessibility, its emotional gravitas, and its catchy score. The most infectiously melodic of all Stephen Sondheim musicals is Merrily We Roll Along, a piece that had a troubled beginning, an extremely short Broadway run, but has gone on to reveal itself to be one of the composer’s most poignant creations. The story of how life’s ins and outs can destroy even the closest and most magical of friendships, this musical has the unique structure of telling its tale backwards. We start with the three friends, bitter and broken, angry and hurt with each other, and then each subsequent scene takes us one step backwards towards their optimistic beginnings. With songs like “Old Friend”, “Good Thing Going”, “Now You Know” and “Not a Day Goes By”, Merrily We Roll Along connects to anyone who has ever lost a friendship. All ingredients accounted for, I consider the musical A Little Night Music to be Sondheim’s greatest achievement. This musical has a strong, witty, timeless book that ensures a long shelf-life and that also legitimately entertains. The characters are so intimately drawn and given such poetic things to say, its is easy to fall in love with them. The multitude of love triangles ensconced in the plot add up to a brilliant structure for everything to descend into chaos and then find perfect resolution.The score just glitters with such character-revealing gems as “Every Day a Little Death”, “Now/Soon/Later”, “Send in the Clowns” and the particularly thrilling “The Miller’s Son” which is a summation of the musical’s themes as seen through the eyes of a libidinous maid. The chief reason that A Little Night Music tops my list is that you walk away from it thoroughly understanding the nature of love and marriage, it’s heartbreaks and its triumphs. The piece is the tightest of all the Sondheim musicals, all of its components knit-together in perfect harmony. Nov 18 Review: Falsettos – Is It Really As Good As The Critics Say?